Donate to Dragon's Mist simply by shopping at Freddy's! Donate to Dragon’s Mist simply by shopping at Freddy’s! 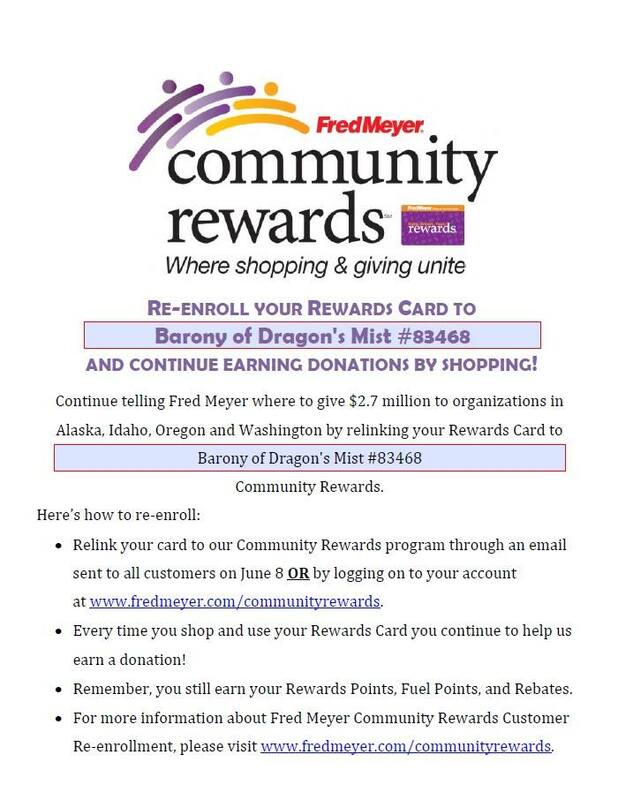 You are now able to link your Fred Meyer Rewards Card to the Barony of Dragon’s Mist by following the link below. Whenever you use your Rewards Card when shopping at Freddy’s, you will be helping us earn a donation from Fred Meyer. If you do not have a Rewards Card, you can sign up for one at the Customer Service Desk of any Fred Meyer store. We have recently upgraded our Community Rewards system, and as a result, your Non-Profit Organization (NPO) has a new account number. (SI648) Please reference the new number when contacting us for assistance. We recommend communicating this new number to your members, and updating any marketing materials with this change. While the previous number will continue to be associated with your organization, it will not be visible to your members when enrolling. New members can enroll by searching for either the new number or the name of your organization.